Custom molded mats protect every inch of your automotive carpet. This is an important message for people who still have their factory floor mats in their vehicles: Take them out! Once you’ve soiled them, they’ll never look new again. They offer no carpet protection from spills or moisture because they just soak it up. To keep your investment looking new, replace your factory mats with the new WeatherTech Floor Liners. They’re called liners for a reason. These mats don’t just lie on the floor. They are molded to hug the curves of your vehicle’s floor for an integrated, smooth look. WeatherTech Floor Liners are unobtrusive yet functional. They do not have the prominent ribbing like some mats. Instead subtle channels are molded so that fluid runs to a patent-pending reservoir at the front of the mat, beneath and behind the pedals. Fluid is away from your feet and the pedals. This unique design also minimizes sloshing while the vehicle is in motion. When you reach your destination, vacuum the water out with a wet-dry vacuum or pull the mat out and empty the reservoir. WeatherTech promises "absolute interior protection"! WeatherTech Floor Liners cover the entire area under your feet, from the console to beyond the edge of the carpet so you won’t dirty the carpet on the way in or out of the vehicle. Digital computer measurement of interior surfaces ensures a perfect fit to any vehicle. The semi-flexible High-Density Tri-Extruded material is completely weatherproof, durable, and stays in place under your feet. Keep your WeatherTech FloorLiners clean and looking new by treating with WeatherTech TechCare FloorLiner and FloorMat Cleaner and Protector! 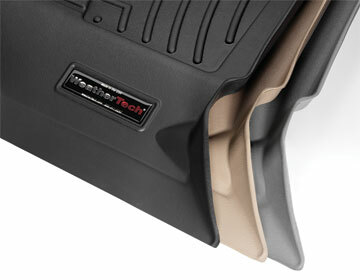 WeatherTech Floor Liners are available in black, gray, and tan to complement the most popular interior colors. Be sure to specify make and model when you order your liners. When it comes to protecting your investment, don’t settle on what’s available at the local Whatever-mart. Get the most integrated, functional floor liners you can buy: WeatherTech Floor Liners.